Gap invites you to “share your gift” this Christmas in its holiday ad, which is also an invitation to follow the fun. 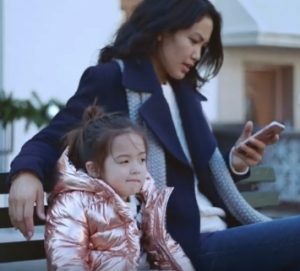 The 30-second spot features a little girl and her mother and a friend who decide to leave the bus station and walk instead, even if it’s raining, a young girl who takes shelter at a pastry shop from the rain, who decides to share her bike with a guy with an umbrella, and two kids who go out from their school to enjoy the first snowflakes. The song used in the ad is “Baby Boomerang” by T.Rex.